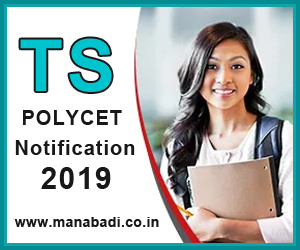 Telangana POLYCET Notification 2019 available now from & www.manabadi.co.in. Flash.. Flash...: TS POLYCET NOTIFICATION for the year 2019 has RELEASED. "Telangana Polytechnic Common Entrance Test 2019 (TS-POLYCET 2019)". This examination known as TSPOLYCET 2019 will be conducted by the State Board of Technical Education and Training, Hyderabad. The examination is held once in a year and is done on state level basis. The students who desire to chose a stream of various engineering/non-engineering diploma courses can adopt for this examination. After the students pass this examination, they can take the admissions in government and private Polytechnic colleges. This article helps you to know more about TS POLYCET 2019 Notification, POLYCET exam dates, eligibility to write POLYCET Exam, TS POLYCET 2019 syllabus and Telangana POLYCET application form. The detailed TS POLYCET Notification 2019 is provided here for your glance. However we suggest you to visit polycet 2019 official website for Notification. This article includes the synopsis of TS POLYCET 2019 Notification. State Board of Technical Education and Training Hyderabad. The candidate should belong to Telangana State. Qualifying Exam:All the candidates who passed the 10th class or equivalent from a recognized Board should have 37% marks in Physics, Chemistry and Mathematics. Visit Official site or visit this page. Manabadi.co.in we will redirect you for POLYCET Applying page. Click on "Apply Online" link. If you make payment via online mode, then click on "Click here to Pay Online using your Credit/Debit Card" link and Pay the fee. Note down your "Reference Number" for further process. After successful fee submission, you can fill the application form by clicking on the link "Click here to proceed to enter application". You have to upload your scanned photographs (size should be less than 30 KB) and signature (size should be less than 15 KB) in a JPEG format. Verify all the filled-in details and click on "SUBMIT" button. The students need to pay the application fee either by debit/credit card or online mode. Fill the SSC Hall ticket Number, Year of Pass and Date of Birth on the application by verifying your SSC Hall ticket /SSC Certificate or its equivalent, as the candidate data is taken from SSC database. The candidate pertaining to the board other than SSC(CBSE/ICSE/NOS) has to visit any of the centres along with his photo for filing online application. The syllabus for POLYCET is the same as that of SSC Examination of March/April conducted by the Board of Secondary Education, Telangana.The Exam Paper for common Entrance Test for admission into polytechnics consists of 120 questions. All questions are of multiple â€“ choice type. Email Id is mandatory to apply for the TS POLYCET 2019. Visit Offcial site or visit this page. Manabadi.co.in we will redirect you for POLYCET Applying page. If you make payment via online mode, then click on "Click here to Pay Online using your Credit/Debit Card" link and Pay the fee. or you can pay at AP ONLINE / TS ONLINE. the candidate is required to verify all the details carefully and press Submit button. Filled in Online Application Form will be generated which contains Registration Number along with filled in details. The candidate is required to take printout of Filled In Online Application Form and it is to be submitted to the Invigilator during the examination after affixing a recent color photograph duly attested by the Gazetted Officer or Principal of the College where studied qualifying examination. Regional Center to which candidate wishes to appear for TS POLYCET-2019 examination. Mobile Number of the candidate. Place where Studied - Municipality / Corporation or Rural area in SSC,Intermediate, Degree. The candidate has to submit the "FILLED IN ONLINE POLYCET 2019 APPLICATION FORM" to the invigilator in the Examination Hall on the day of the TSPOLYCET-2019 exam. Also, affix a recent color photograph (3.5cms x 3.5cms) in the box provided (Bottom / Left side) on the "FILLED IN ONLINE POLYCET 2019 APPLICATION FORM" and get it attested by a Gazetted Officer / Principal of the college where studied. The candidate belonging to SC / ST category has to submit the attested "CASTE CERTIFICATE" along with the FILLED IN ONLINE APPLICATION FORM" to the Invigilator on day of the TSPOLYCET-2019 exam in the Examination Hall, in case, the Application number of his/her Caste Certificate is not provided at the time of the Online submission of the Application. If you have submitted the form with some wrong information, you can re-correct them before the last correction date shared by the university. Online Mode needs many information like birth date, father-mother name, passing year, transaction id, the name of candidate etc. It is advised to visit your allotted Examination Center well before so that you can take examination tension free. The candidate will not be allowed to take the examination even if late by 1 minute. The candidate does not have option of choosing specific date / session to appear for the TS POLYCET-2019 entrance examination. This information is known to him / her only after downloading Hall Ticket. For any reason if the candidate fails to appear in the given slot, he / she is treated as absent. The TS POLYCET 2019 language will be Telugu and English only. The qualifying percentage of marks for the TS POLYCET-2019 is 37 maximum marks considered for ranking. However, for candidates belonging to Scheduled Caste and Scheduled Tribe, no minimum qualifying mark is prescribed. But their admission will be limited to the extent of seats reserved for such categories (vide G.O.Ms. No. 179, LEN&TE, dated 16.06.1986). How to Prepare for TS POLYCET Exam? Go through all the previous examination paper of TS POLYCET 2017, 2016, 2015 etc. Once you practiced the examination go to Mock examination conducted by government of andhrpradesh. details are furnished soon. The Exam Conducting Authorities will provide the hall ticket i.e. admit cards for 2019 year in the 3rd week of April 2019. You need to keep the admit card carefully and keep at least two copies of it. You can get the copy of admit card from official website of TS POLYCET 2019. You need to submit the birth date and registration number. After filling all these details, you need to press the submit button shared below boxes, now after processing you will see your admit card, Just take the print out of it. On admission date, the candidates need's to bring additional documents with admit card, Attested copy, photocopy and filled the application form. The syllabus for this examination is prepared. The students who will appear for the examination will get the result from the official website and from www.manabadi.co.in. They will be ranked on the basis of marks obtained in the 2019 exams. The OMR Answer Sheets will be provided to the students till six months from the date of publication of results. For counseling, the students need to keep their online Application Form until the end of the admission process. While verification of the documents, they need to provide other documents and admit card to the desired authorities. The official website either the counseling portal will be providing the Information Booklet for TS POLYCET 2019 counseling.